From Hackberry and Holly Beach we moved east along I-10. 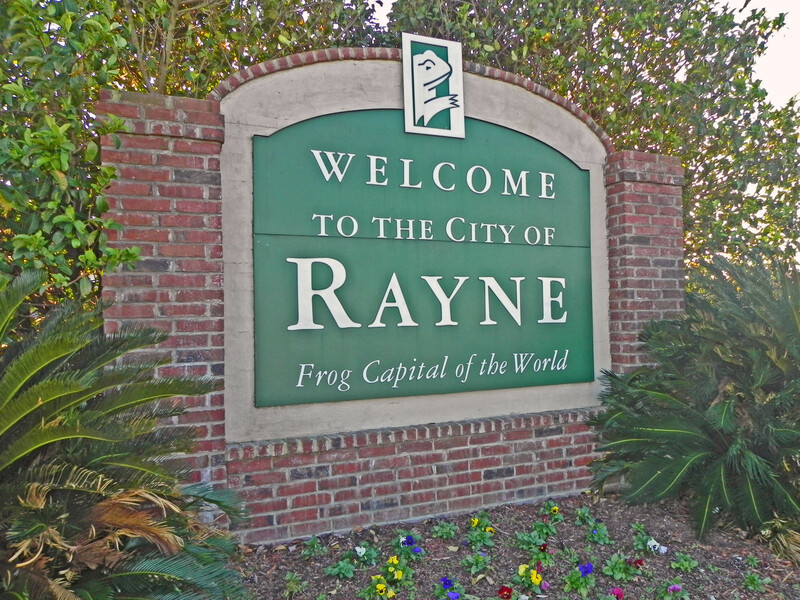 We took the exit to a little town named Rayne, Louisiana. We left the freeway because I have a nephew named Raine. Curiosity got the best of us. 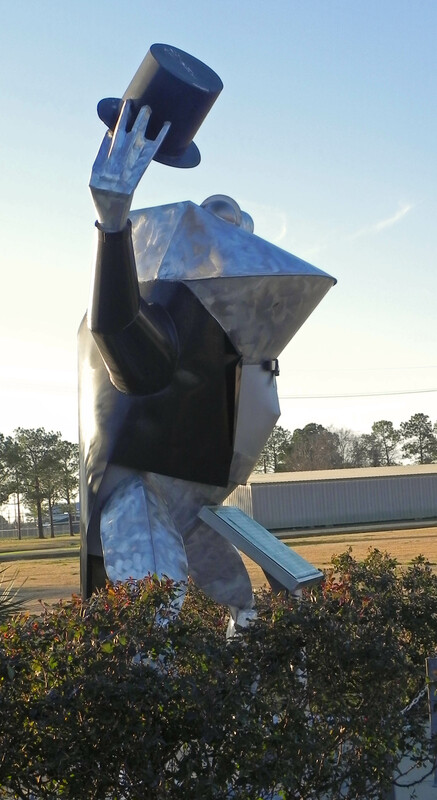 Imagine our surprise when one of the first things we saw upon entering the burg was a giant metal sculpture of a frog, complete with tails and a top hat. One thing you need to know is that BJ’s and my mascot for the southern tour was Jerry, a small stuffed frog whose job it was to deal with assorted frustrations and any potential road rage. Poor Jerry looked like a tiny, forgotten tadpole by comparison. Frog Capital of the World,” and sundry other items. The ironic part was the fact that this twelve foot tall example of creativity gone ballistic stood in front of the police station of Rayne. When you stop to think about it, it’s a good way to get people to slow down as they enter town. We rested for a while, looked at the nearby shops, and took a short break from traveling. The tree-lined residential streets exuded southern comfort and a down-home welcome. People waved and smiled. It was one of those towns that you could become a part of on short notice and be content while you were there. As most people know, mid-January isn’t the prime time to visit any town to see it at its best, but Rayne looked good regardless of the month. 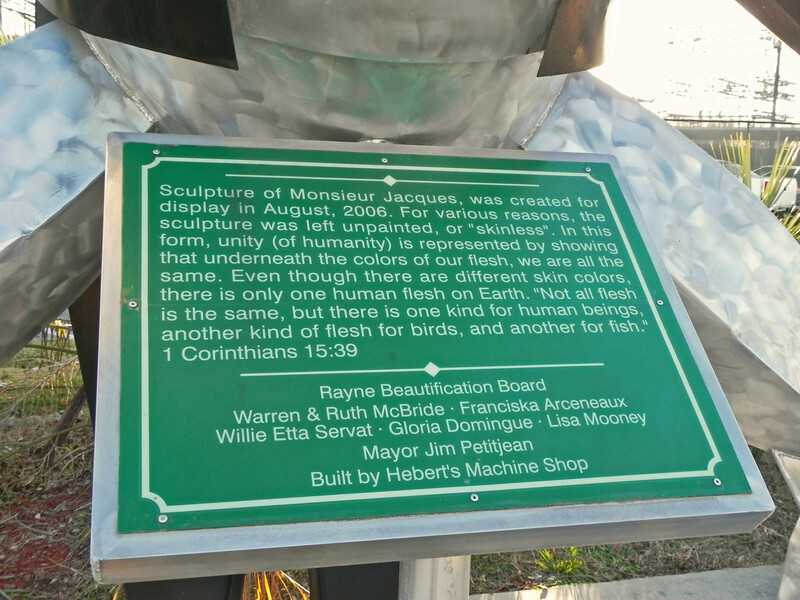 Picture it–surprise that left us stunned as we sat in Oklahoma that first week in March, listening to the terrible reports coming in of the tornado that tried to wipe out Rayne, LA. We were concerned for those friendly people and their tidy homes. One woman died protecting her child from the storm, as a tree crashed into her home, crushing her. Others were injured and 100 homes destroyed. Two months—that’s how long it had been since our visit, and now we wouldn’t recognize the community, much less enjoy it. The area had seen so much devastation in the past several years. Though the town had missed a direct it by Katrina, they couldn’t dodge this storm out of Mexico. The town has since begun the long process of rebuilding lives and structures. They’ve kept their Frog pride and moved on toward a brighter future. For that we must give them kudos. 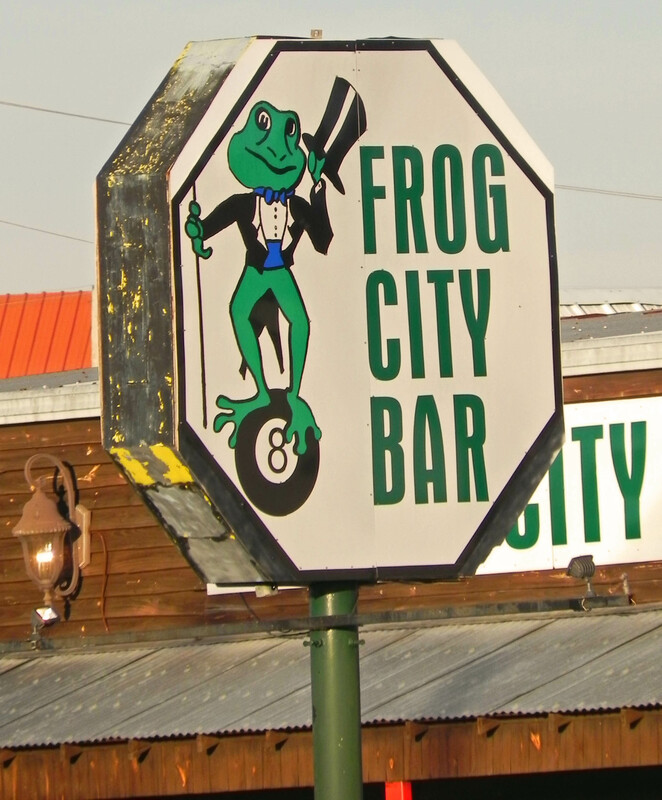 If you get a chance, stop by the little town that loves frogs. Talk to the people and enjoy the hospitality shown you. Take the time to see what they’ve come from and envision where they’re going. When we left the Frog Capital, we sailed through bayous and around Baton Rouge at dusk. We’d passed rice fields—some harvested, some still underwater. It continues to amaze me that Louisiana is one of the top rice producers in the U.S. Then again, I’m always surprised each time I’m reminded that rice is grown anywhere in the U.S.
Once we got past the capital—it was too late in the evening to really see anything–we pulled into Hammond for an overnight. We met friends, who’d come up from New Orleans, for an early breakfast the next day. We would’ve been staying with them for a few days if one major block hadn’t reared up to strike down our plans. New Orleans has few free parking places and no freebies that are safe. Ask any resident. To secure a safe space a person pays an average of $30 per day/night for the privilege. Sorry, our budget couldn’t stretch that far. We were adventurous, but we hadn’t lost our minds entirely. As a result, staying in New Orleans was not an option this trip. After a marvelous visit with our friends, BJ pointed the car east again and slipped onto I-10 in pursuit of more to see and things to learn.